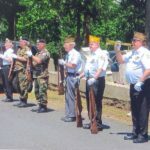 The Charles Baber Cemetery celebrates three very special days each year, Arbor Day, Memorial Day, and Baber Appreciation Day, and several minor events. The events on these special days are important and unique. Each event is open and free to the public. 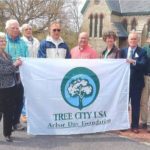 The celebration of Arbor Day on the last Friday of April, starts the year off. Each year 10 new trees are planted, and the money received from the $400 per tree sponsorship is used to remove 2-3 dead trees and to prune large dead limbs on other trees. The public celebration, held at 2:00 PM, includes the reading of poems or essays by several high school students, attendance by the forestry service, Shade Tree Commission, city council representatives, and tree sponsors. 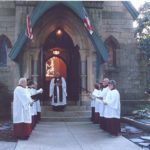 Each tree is blessed by the rector or a representative from the Trinity Episcopal Church. Following quickly on Arbor Day’s heels is the Memorial Day celebration on the Friday before the Memorial Day weekend. Fourth grade school children from the nearby Pottsville School District participate in this event along with the Joint Veterans’ Association. School buses deposit the children at the entrance gate and the various classes all take a section of the cemetery and replace the old worn flags on the veterans’ graves with new ones. Prayers are read along with a poem or essay, taps are played, and the service is concluded with a 21 gun salute. Welcoming in the fall season, Baber Appreciation Day is celebrated on the Sunday following Labor Day. It is a festive picnic free to the public. There are nature and historic walking tours, entertainment by the Third Brigade Band, a bake sale, a picnic, and a small basket raffle. Visitors bring their own folding chairs and sit and listen to the band as the music floats through the trees. The celebration concludes with an Evensong service in the chapel. There are other minor events or celebrations throughout the year. Sometimes a meditation or “quiet” day is held at the chapel. Sometimes a pet blessing service is held on St. Francis’ Day. On All Saints’ Day, a necrology is read at the chapel. During the summer months, a Sunday morning church service is held at the Chapel of the Resurrection. On all these occasions the public is invited to attend free of charge.